When you find a hole in a wool sweater, it doesn't mean you need to throw the sweater away. 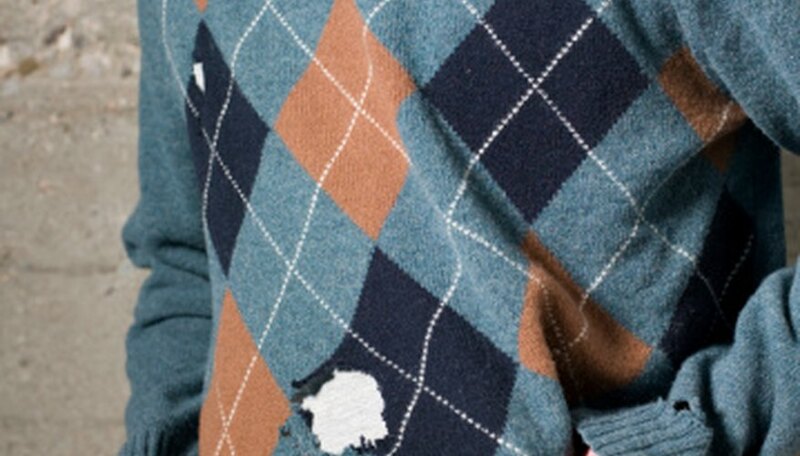 You can repair a wool sweater in a variety of ways, depending on the size and severity of the hole. If you don't have much experience with knitting, consider sewing a simple patch over the hole or covering it with an iron-on embellishment. With a little more time and a few more skills, however, you can make the hole virtually disappear. Lay the sweater out flat on a work station in front of you. Pull any loose threads surrounding the hole to the back or inside of the sweater to get them out of your way as you work. Thread a length of matching yarn onto a large eye blunt needle or an embroidery needle. The yarn may have come with the sweater or you may have to shop for something that matches as closely as possible. Weave the yarn through the stitches that are exposed around the edges of the hole. For a small hole, pull on the yarn to gather the stitches together, then weave in the ends on the inside of the sweater. For a larger hole, proceed to Step 4. Graft the stitches together. To do this, weave up from bottom to top through the bottom right stitch, then pass the needle from right to left through the center of the top right stitch. Pass the yarn up through the center of the stitch immediately to the left of this from back to front. Bring the needle back down from top to bottom through the center of the bottom right stitch. Repeat this step working right to left across the hole until you have created a new row of stitches to fill in the hole. Weave in your loose end of yarn on the wrong side of the sweater, working through several stitches to secure it in place. Arrange a foam block underneath the hole in the sweater. Position the block so that the hole or tear is directly above it and the block protects any other layers of the sweater. Position the edges of the hole or tear so that they overlap slightly. Use a felting needle to hold these layers together. To do this, simply poke the needle down through the two layers of the sweater and into the foam block. Use a second felting needle to poke through the layers of wool. Start at one end of the hole and poke short jabs with the needle, up and down repeatedly, to felt the layers of sweater together. Repeat this along the length of the hole to the other end to close the hole entirely. Go back over the seam you just made, continuing to further felt the fabric together with repeated up and down motions of the felting needle. Stop when you can pull on the fabric and it does not separate or re-open the hole. Remove the felting needles from the sweater and take out the foam block.